Ever since God placed the word “sacrifice” on my heart, the practice of fasting has flirted around the edges of my consciousness. I am afraid to admit that at the age of 30, and as someone who has been a Christian for almost as long, I have never really fasted. The last couple of weeks have been physically, mentally and spiritually exhausting for me. The illness of my children, the battle with depression and a barrage of lies from the enemy have left me depleted. While wasting time on Facebook, I saw an announcement from our denomination that the President of the Foursquare Church was asking for leaders to join him in a 21-day fast. So, starting tomorrow I will be fasting. Josh and I talked it over and came up with a plan. Our normal routine after the kids go to bed is to watch TV, and we usually end up getting munchie and having a snack. For our fast, we will not eat, watch TV or go on the computer after the kids are in bed. Instead, we will be using that time to pray together, go through a book in the Bible and spend time together seeking out the Lord. I am so very excited for this! Additionally, this week I will be looking into the practice of fasting, and share what I’ve learned. Part of the reason I’ve never fasted in the past was that I didn’t understand how my going without food glorified or drew me closer to God. I’d like to explore the idea a little more, and thought you all might be interested in it as well. Plus, I’m interested to hear your insights into fasting. If you’re interested in joining us in our fast, please let me know in the comments. How you do it, what you give up, doesn’t have to be the same as us; it could instead be snacks between meals, one meal a day or an activity. You can go here to find out more information about fast that Foursquare is doing and the daily prayer points they have set up. 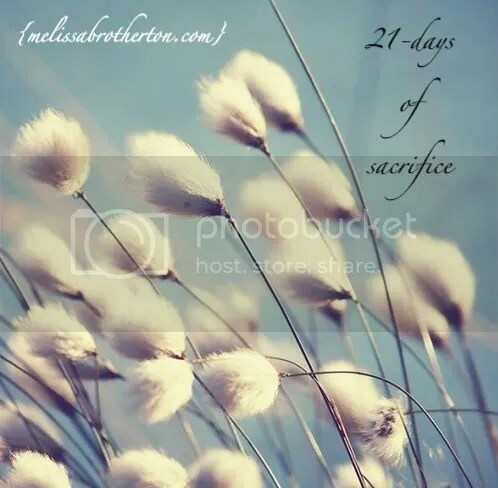 Would you be interested in joining me as I fast for the next 21 days? What questions do you have about fasting? I’ve always thought of that verse in Matthew 6 when I’ve thought about fasting. I knew it was something I should be doing, but I always felt like my reason for doing it was wrong: trying to convince God to give me what I want through a show of my righteousness, dieting, spiritual posturing. In doing this fast I know that I am genuinely seeking God and what He would say to me. Your experience with it is encouraging to me, Jen! Thanks for sharing that! this is probably the fourth or fifth time over the past few days the Lord has brought fasting to my mind. last semester i fasted at least once weekly for my beloved and i. i have to wonder if part of my difficulty in keeping my focus in the right place, on the Lord, isn’t related to my lack of discipline in this area (among others, sadly). i would love to join yall. i’m going to be praying today about exactly what the Lord wants this fast to look like for my heart. Great! We’d love to have you join us. In my studying so far, I see that a lot of times fasting is done in community. I can totally see how having people support you can make the experience easier as well as work to hold you accountable. :) I’d love to know what you felt like God was saying this would mean for you. my husband and i actually just finished a 21 day daniel fast. we broke it yesterday. our fast was a food one. no meat, no dairy, no refined sugar, no white flour, no leavened bread. basically a vegan diet. it was hard, but good. my understanding of fasting has always been that you’re taking something away and replacing it with the Lord. in a food fast, it’s your hunger (or craving for sugar or a pretzel) that’s reminding you to pray or meet with Him. we were fasting because we want clarity. we wanted to see Him better and know more clearly what his will for us is at this time. it was good. i kind of feel like these past couple of days have been the best as far as ability to connect with Him goes. it also brought my husband and i closer. and i found some fabulous recipes! :) i’m looking forward to hearing more of your thoughts and how the Lord works in your heart during your fast! That’s fabulous, Kellie! :) I’m going to have to look up the term “daniel fast” because I want to see what that entails. I’ve heard people talk about that before, but I’m not really sure what it means. It’s so encouraging to hear how your relationship with God and your husband has been positively impacted by your fast. Have you ever fasted before, or was this your first time? Melissa, I’m encouraged by your faithfulness. Thanks! I try to do a Daniel Fast (usually we do a church-wide fast) once a year. Time and time again it proves to be a refining time where God speaks to specific areas in my life. You’re the second one to mention a “Daniel Fast.” I don’t actually know what that is…but I’m going to look it up. :) I’m encouraged by the benefit you have gained from your past times of fasting. Thanks for sharing that! Oh sure, I would have to read this as I sit down in front of the computer with a tub of Tillamook Udderly Chocolate. (I know, I know, but I only eat it out of the tub because I only want a few bites and don’t want to waste a bowl. No really, I’ve tried using smaller bowls, I still never finish it. I’ve gotten accustomed to tiny portions sizes of sweets since I’ve been diabetic.) Maybe God is trying to tell me to fast from sweets. That sounds more like a diet than a spiritual thing, though! I’m going to think about fasting today and see if and where God is leading me. Mmm…Tillamook ice cream. It still irks me that the grocery store down here sells Tillamook cheese and butter, but not the ice cream or yogurt. :) What you mentioned is exactly the reason I’ve never fasted before. I always felt like I was going at it with the attitude of dieting, rather than drawing closer to God. Whenever anyone would mention a fast I would think, “Oh, that would be a good way to jump start myself into a better eating habit.” I knew that my attitude wasn’t right, so I never did it. :) This time I’m really hoping to seek out God, not focusing on midnight snacks. Haha! Melissa…I am not surprised anymore when God leads me to your blog, because I know that there is always something there that He wants me to read. Fasting is something that I have never done, but it is around me…constantly. At the close of every service, my pastor asks for at least 2 people to commit to fasting each day for the rest of the week! I have yet to raise my hand and commit. Why haven’t I done it? I’m not sure. Laziness maybe? I know and understand the meaning for fasting, but yet I still “hide” from it. Why I think it is a scary thing is beyond me, but I do. I don’t want to make that commitment to give up something…that sounds so awful! We are facing some HUGE changes…selling our house…looking to buy a new one. I want another baby…hubby does not. Now more than ever I need clarity; need to hear His wisdom and His plan. I need silence to focus and to listen for His words and direction. I am going to talk to my hubby tonight about joining me in this, but I am definitly in! I am going to give up “me” time in the evenings when the kids are in bed and spend that time in fasting. Trying to do it during the day when the kids are needing me is just impossible. The nighttime fast will work best for me to fully listen and obtain that quietness. I will be praying for you during this next 21 days. That you will hear His voice ever so clearly. That you will stick to it and not give up…even if His words are difficult to hear. Thank you, as always, for your words and your honesty! I love how God uses wonderful, Christian, bloggers to speak to the hearts of those He loves! Do you know how encouraging it is to hear that! :) Sometimes I wonder why I continue to write here, I worry that people will tire of my constant struggle to draw close to God or that what I’m dealing with is to simplistic. So, to hear that you connect with what I’m sharing and that God spoke to you through it is so wonderful! Thank you for letting me know. As I continued in my time of solitude and reflection I became satisfied with the simple answer that, for me, it’s about obedience – not that I’m commanded to fast, but that simpler obedience of doing the things I see Jesus doing. Christy and I will be joining you and others in our denomination in this season. I might not understand all the in’s and out’s of this discipline, but I can at least respond when God is so clearly leading me into it. We’ll be praying today about what this will look like, but I have a strong leaning toward some type of fast from food. I definitely think obedience is a huge part of fasting, that also goes along with my ideas on sacrifice. I think both are more about us, and not about Him. Looking forward to hearing about the things God does in your life over the next season! :) Say hi to your wifey for me. Thank you, Jenny! :) You’re always such a support to me. I like the results of fasting–spiritual discernment and clarity–but the hardest part for me is the getting started. I know I would benefit from calling fasts from time to time, but it’s really a hard one for me! If I hear God and know He’s asking me to do it, it’s different though somehow. Anyway, blessings on your fast, Melissa. I know it’ll be a great time for you guys. Honestly, I don’t think we should fast unless we feel God calling us to it. I think this, like so many other church disciplines, can become a legalistic ritual, rather than the relational refreshing and preparation God intends it to be. So far in my studying I’ve discovered that God called the nation of Israel to fast only once a year, on the Day of Atonement. They had numerous other occasions where He intended them to feast, but the fast was initially only an annual event connected with cleansing. I personally would much rather have everyone come together for a feast, rather than a fast. Haha! i just finished a 21 day fast yesterday. i had nothing but liquids for the past 21 days as i had to die completely to my food/sugar addiction. i dont recommend anyone fasting that long without food unless they clearly heard from God to go without food (and that they ask a doctor too). i know it was a God thing coz i felt so much grace and strength even if this single mama was working full time and homeschooling full time. it’s something i had to work with slowly, starting from 3 days to 7 days, to 2 weeks, etc. i had a phenomenal time! it was humbling, it was exciting, it was an adventure with God. my dream is to do a 40day water fast one day. i love love love fasting. though giving up food is not for everyone..fasting (something) is a discipline that i believe all of His children should practice. it allows us to totally depend on Him. i say its a gift like celibacy… it’s not fun but the rewards are amazing. fast. seek His face. the results are always worth it. He promises that if we do, He will bring healing, hear our prayers and heal ourselves and our land. That’s quite an accomplishment, Patricia! I agree, I don’t think anyone should undertake that type of fast unless they feel God specifically calling them to that. I love your excitement about what God did during that time though! It’s so encouraging. :) Thank you! As soon as I read your post I knew that this was something I needed to do. I hesitated talking to Eric about it knowing that once it was out there, there was no taking it back… I may have to commit. But then he brought it up! So I knew God must be trying to get our attention. We have decided to give up that extra hour of sleep in the mornings in order to have a real quite time with God. We have both been feeling the need to be more disciplined and have a regular time. So, I know it’s not food, but we will be joining you for the next 21 days! You and Josh will be in our prayers as well. I pray the we all get direction and clarity for the next season in our lives. It’s actually not completely about fasting, but I learned about fasting through this sermon, and I think you will too. I hear your heart and see that God has called you and Josh to this fast. I pray that it will be a time of strengthening in the areas in your life you are experiencing weakness.